The American Volunteer Group (AVG) and Royal Air Force (RAF) fought side-by-side over Rangoon with comparable numbers, equipment, and courage against the same odds. The RAF barely broke even against the Japanese, while the Americans rolled up a 15-to-1 score. In February 1942 the Japanese threw heavy raids against Rangoon and Port Darwin, Australia, in the same week. Over Rangoon five AVG P-40s shot down 17 out of 70 enemy raiders without loss. Over Darwin, 11 out of 12 USAAF P-40s were shot down by a similar Japanese force. A few weeks later a crack RAF Spitfire squadron was rushed to Australia from Europe and lost 17 out of 27 pilots over Darwin in two raids. The Spitfire was far superior to the P-40 as a combat plane. It was simply a matter of tactics. RAF pilots were trained in methods that were excellent against German and Italian equipment, but suicide against the acrobatic Japs. The only American outfit in China that the Japanese ever liked to fight was a P-38 squadron that had fought in North Africa and refused to change its tactics against the Japanese. During the first year of the war, AVG's tactics were spread throughout the Army and Navy by intelligence repots and returned AVG veterans. At least one Navy Commander in the Pacific and an AAF colonel with the Fifth Air Force in Australia were later decorated for "inventing" what were originally AVG tactics. Following the attack on Pearl Harbor on Dec 7, 1941 an agreement was worked out between the Chinese and the British whereby one squadron of the AVG would assist the RAF in the defense of Rangoon with the other two squadrons to be stationed at Kunming, the China end of the Burma Road, where there was an adequate warning net and dispersal fields. The Third AVG squadron moved to Rangoon on December 12, 1941 to join the RAF in the defense of Rangoon. The First and Second Sqns flew from Toungoo to Kunming on the afternoon of the 18th. The first combat for the AVG occurred over southern Yunnan Province on Dec 20, 1941 when a combination of the First and Second Sqns shot down 9 of 10 Japanese bombers with a loss of one AVG aircraft. The second engagement brought the Third Sqn onto action over Rangoon on Dec 23, with the RAF flying beside the Tigers. The total Jap losses was six bombers and six fighters. The RAF lost five planes and pilots, the AVG lost four planes and two pilots. Then, on Christmas Day, two waves totaling 80 bombers and 48 fighters hit Rangoon. The AVG knocked down 23 of them, the biggest victory of the war, with reportedly six more shot down over the Gulf of Martaban. The AVG did not lose a single plane. The 28th brought another heavy enemy attack20 bombers and 25 fighters. The AVG got 10 of them with no losses. The next day, the Japs threw 40 bombers and 20 fighters against the Tigers who scored 18 kills with a loss of only one aircraft. The last day of the year dawned with no letup in the Jap assault. 80 planes darkened the skies over Rangoon. The Tigers shot down 15 without the loss of a plane. In 11 days of fighting, the AVG had officially knocked 75 enemy aircraft out of the skies with an undetermined number of probable kills. AVG losses were two pilots and six aircraft. Early in January the Rangoon defense was reinforced by eight planes from the First Sqn and the AVG began their first strafing of the war. Hitting the Jap air base in Thailand, they wiped out 12 planes on the ground. On Jan 13, the remainder of the First Sqn joined the other AVG forces at Rangoon and there followed a series of raids on Jap air bases. Ten days later, Jan 23, after a series of engagements over Kunming and Rangoon, the Japes attacked Rangoon in force again. 72 planes appeared there and the AVG got 21 of them with the loss of only one pilot. Air battles continued over Rangoon until it finally fell to enemy ground forces at the end of February. During that time, in one strafing raid in Thailand the AVG knocked out upwards of 60 enemy aircraft on the ground, the biggest ground victory of the war. However, advancing Jap ground forces in number slowly drove the AVG back to bases at Magwe in Burma and, eventually, into the interior of China. There, the Tigers continued to carry out their final missions, supporting the Chinese ground forces on both eastern and western fronts as well as defending Chinese cities against attacks by the JAF. "Although the AVG was blooded over China, it was the air battles over Rangoon that stamped the hallmark on its fame as the Flying Tigers. The cold statistics for the 10 weeks the AVG served at Rangoon show its strength varied between 20 and five serviceable P-40s. That tiny force met a total of a thousand-odd Japanese aircraft over Southern Burma and Thailand. In 31 encounters they destroyed 217 enemy planes and probably destroyed 43. Our losses in combat were four pilots killed in the air, one killed while strafing, one taken prisoner, and 16 P-40s destroyed. During the same period, the RAF, fighting alongside the AVG, destroyed 74 enemy planes, probably destroyed 33, with a loss of 22 Buffalos and Hurricanes." Winston Churchill, Prime Minister of the United Kingdom, added his eloquence to these statistics, cabling the Governor of Burma: "The victories of these Americans over the rice paddies of Burma are comparable in character, if not in scope, with those won by the RAF over the hop fields of Kent in the Battle of Britain." Air Vice-Marshal D F Stephenson in Jan 1942 noted that "While the ratio of British to German planes in the Battle of Britain and been one-to-four, the ratio of Anglo-American fighters to Japanese planes over Rangoon was one-to-from four to 14." "Before I left the USA in the summer of 1941, I had asked a few friends to watch the newspapers and send me any clippings about the AVG. I was swamped with clippings from stateside newspapers, and my men were astonished to find themselves world famous as the Flying Tigers. The insignia we made famous was by no means original with the AVG. Our pilots copied the shark-tooth design on their P-40's noses from a colored illustration in the India Illustrated Weekly depicting an RAF squadron in the Libya with shark-nose P-40s. Even before that the German Air Force painted sharks teeth on some of its Me.210s. With the pointed nose of a liquid-cooled engine it was an apt and fearsome design. "How the term Flying Tigers was derived from the shark-nosed P-40's I never will know. At any rate, we were somewhat surprised to find ourselves billed under that name. It was not until just before AVG was disbanded that we had any kind of group insignia. At the request of the China Defense Supplies in Washington, the Walt Disney organization in Hollywood designed our insignia, a winged tiger flying through a large V for victory." After the fall of Rangoon, the sluggish match between the Japanese Air Force and the AVG-RAF combination continued over Northern Burma. The Japanese had an estimated 14 air regiments spaced in Southern Burma and Thailand with a strength of 400500 planes. That compared with about 30 serviceable fighters and a dozen Blenheim bombers of the Allied force." In his official report on the Burma campaign Air Vice Marshall D F Stephenson had this to said: "In the Burma campaign the main brunt of the fighting was borne by the P-40 squadrons of the AVG. They were first in the field with pilots well trained and good fighting equipment. The great majority of enemy aircraft destroyed in Burma fell to their guns. Their gallantry in action won the admiration of both services." After the Burma campaign ended with the capture and occupation by the Japanese of that country, the AVG continued its fight against the Japs, first in Western China and then in Eastern China. "The group that the military experts predicted would not last three weeks in combat had fought for seven months over Burma, China, Thailand, and French Indo-China, destroying 299 Japanese planes and with another 153 probably destroyed. All of that with a loss of 12 P-40s in combat and 61 on the ground, including 22 [intentionally, in retreat] burned at Loi-Wing. Four pilots were killed in aerial combat, six by anti-aircraft fire, three on the ground in enemy bombings, ten in flying accidents, and three were taken prisoner. Although the Japanese promised in radio broadcasts to shoot AVG prisoners as bandits, they treated our three prisoners as well as British and American POWs, likely an indication of the enemy's genuine respect for our organization. 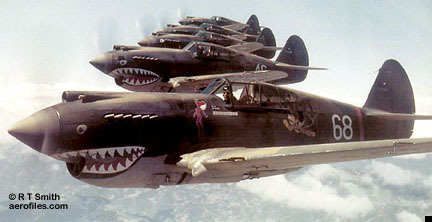 The flashing sharks teeth of our P-40s and our trademark as Flying Tigers were world famous." "The group had whipped the Japanese Air Force in more than 50 air battles without a single defeat. With the RAF it had kept the port of Rangoon and the Burma Road open for two and one-half precious months while supplies trickled into China. With less than a third of its combat strength, it saved China from final collapse on the Salween. Its reputation alone was sufficient to keep Japanese bombers away from Chunking. It freed the cities of East China from years of terror bombing and finally gave both Chinese and American morale an incalculable boost at a time when it was sagging dangerously low. All this cost the Chinese $8,000,000about $3,000,000 in salaries and personnel expenses and $5,000,000 for planes and equipment. After the final accounting was made, I wrote Dr T V Soong [a principal sponsor of AVG] my regrets that expenses had exceeded my original estimates. "He replied: 'The A.V.G. was the soundest investment China ever made. I am ashamed that you should even consider the cost'." In April 1942 President Franklin D Roosevelt added: "The outstanding gallantry and conspicuous daring that the American Volunteer Group, combined with their unbelievable efficiency, is a source of tremendous pride throughout the whole of America." When the American Volunteer Group was disbanded, the China Air Task Force of the United States Army Air Forces, commanded by Chennault, officially took over air operations in China. In early March 1943 the 14th Air Force was activated under the command of Chennault, as an AAF General, and replaced the China Air Task Force. Chennault remained in command of the 14th Air Force until the end of July 1945, then formally retired from the military for the second time in October 1945.